Rise Networks, Nigeria’s Leading innovation driven Social Enterprise has announced a strategic partnership with the 2019 BIG DATA & BUSINESS ANALYSIS CONFERENCE, a 2 day conference that will hold from March 05 – 06, 2019 in Lagos, Nigeria that aims to bring together the leading figures in big data and business analytics across sectors in Sub-Sahara Africa. The primary objective is to discuss ways businesses can take advantage of their data as intellectual property to make informed strategic business decisions. It is time for business leaders and policymakers in Africa to shift from making intuition-based decisions to making data-driven decisions that align with organization strategies. This conference will include panel discussions, workshops, executive networking cocktail and exhibitions from brands and stakeholders. Venue is Radisson Blu Hotel 38 – 40 Isaac John Street Ikeja GRA, Lagos Nigeria. Vice President of Nigeria, Prof. Yemi Osinbajo is the Keynote Speaker and other Top Speakers include Prof. Ndubuisi Ekekwe, Founder & Chairman, Fasmicro Group, Prof. Anindya Ghose, Professor of Business at NYU Stern, Ms. Yemi Keri, CEO, Heckerbella, Mr. Bayo Adekanmbi, Chief Transformation Officer, MTN Nigeria. 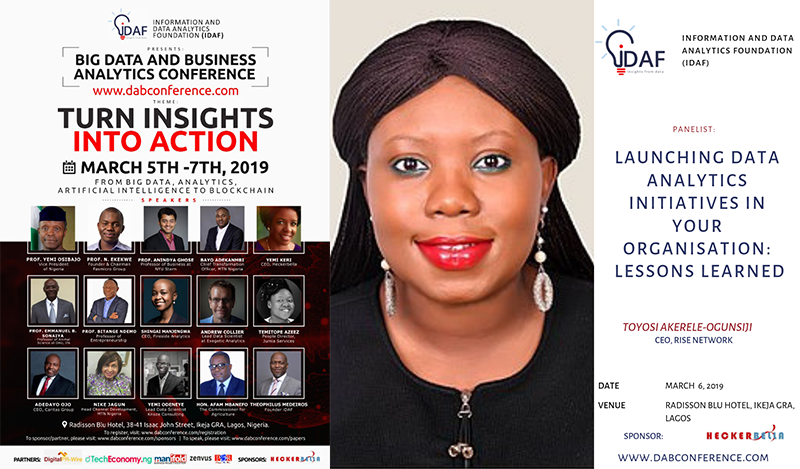 Founder/CEO of Rise Networks, Toyosi Akerele-Ogunsiji will also be speaking on the Panel hosted by Heckerbella on “Launching Data Analytics Initiatives in your Organization: Lessons Learned”. She will share insights on how Rise Networks is applying AI, Robotics and Machine Learning to improving the work readiness skills and curb widespread youth unemployment in the country with their Job Bot – Ise. Other topics to discussed include Using AI and Blockchain to Monetize The Mobile Economy, What Blockchain and AI Could Mean for Mobile Marketing, Analytics in Cybersecurity, The Future of Data Analytics: Use Cases from Industry Experts, Examining the Legal Framework for Data Protection in Nigeria. To find out more, please visit https://dabconference.com.